Email Any suggestion, question, or feedback? Please email us at support@ramblr.com. Ramblr is a service to record and share your outdoor activities such as hiking, biking, skiing, kayaking, road trip, travel, or any type of trip. By creating a trip with Ramblr you will be able to share your story with more than a track or a photo. Ramblr tells your story the way it was meant to be told. Ramblr lets you see your route on a map with geotagged photos, video, notes along with descriptions, stats and more. The Ramblr app (available for iPhone / Android) can record any of your outdoor activities and after uploading them to Ramblr.com you can share your trips with Facebook, Twitter, Pinterest, shareable links, and HTML. You can also create trips with a GPS file (gpx,kml) or our track editor tool on Ramblr.com. How do I sign up for Ramblr? Download the iPhone or Android app and sign up or visit www.ramblr.com and click on sign up. Sign up with Facebook, Google+, or your email and follow the prompts to create a new account. You will receive a verification email through your email account that you provided while registering. After verifying your account, you will be able to log in to Ramblr.com or the apps with your same username and password. Is there a charge or fee for using Ramblr? There is no fee or charge to use Ramblr. The apps are also free to download. Can I use the Ramblr App without a phone signal / data network connection? Yes. Ramblr still works without a phone signal / data network connection (although some features and map display may be limited). But, Ramblr needs a GPS signal to record trips. How do I make a trip with the iPhone or Android app? Open the app and press the record button. While you are tracking your route you can add notes, audio, video, or photos by selecting the button of the media you wish to record. Select the camera icon to take a picture, select the microphone button to record audio, select the notebook to record a note, or select the video button to record video. When you stop recording you’ll be asked to select the option for uploading. If you choose upload now, the progress bar will notify you when it is finished uploading. If you choose upload later, the trip will be saved to your phone as a draft and you can upload the trip later. Once you’ve uploaded a trip, you can access that trip on Ramblr.com or the app. It will be listed in your My Archive page. How does uploading a trip from Ramblr’s app work? When you track with the Ramblr app, you will be asked if you wish to upload now or later. If you choose not to upload right away, your trip will be saved as a draft to on your Ramblr app on your phone (it is not on Ramblr.com yet). This means you can wait until reaching a wifi connection or to return to an area with enough cellular service before uploading. Once you’ve uploaded your trip, it will be accessible both on your app and on Ramblr.com. You can log into Ramblr.com on your desktop browser and work with your trips online or view your trips on the app. How do I take the HTML to my blog or website? You can take the HTML from any of your trips to your blog or website by following these steps. 1) Log into Ramblr.com in your full desktop browser. 2) Go to My Archive and select the trip you want to share. 3) Press "Share" at the top of the trip & then select "Grab the HTML". 4) Copy and paste the HTML to your blog or website. To edit your profile click on the gear icon in the top right corner of the page then select Edit Profile. You can customize your user photo and background photo of your archive page, manage notices, or change your password. Press Save Profile at the bottom of the page to save any changes to your profile. You also can do it on the phone app (more->Profile->Edit Profile). How do I know when someone has liked or commented on my trips or photos? You will see notifications alerting to you when someone has liked or commented on your trip, photos, or when someone you follow has uploaded a new trip on both the Ramblr app and Ramblr.com. On the website you will also see a number over your username alerting you to unseen notifications. Click on your user name in the top menu bar to see your notifications. On the app, select Notifications from the menu to see all your notifications. How do I manage my emails from Ramblr/notifications? Emails about activity on Ramblr will be sent to your email and can be managed under your Edit Profile page. To reset your password go to www.ramblr.com in your full desktop browser. Then select the gear icon in the top right corner and click edit profile. Then change your password (located in the Password tab) and click ‘save password’. If you’ve forgotten your password at login, click ‘forgot password’ and follow prompts. A temporary password will be emailed to you and you can log into Ramblr.com and reset your password. How do I log off the app? You can log off the app, but it is NOT required in general. To log off select "More" from the main menu bar, then press "Account Settings". Select the logout button. Send an email to support@ramblr.com with your email address that you used to sign up for Ramblr and your Ramblr ID/screen name and we will remove your account. This can not be reversed and your trips will be deleted. Where can I download specific maps for offline use on the iPhone app? How do I change the privacy settings of my trip? You can change the visibility (privacy) settings for any trip on the app or on Ramblr.com. You can do this by editing your trip. In the app: select the trip, then select more “...”, then select edit trip, then select Edit Title/Desc. to change the visibility. Select the check mark to save. On Ramblr.com: go to My Archive, select the trip, press edit, and change the visibility setting at the top right of the trip. You can share your trip with family and friends without making it public by changing the privacy of the trip to "secret". This allows anyone with the link to view the trip. Private means only you will see it. Public means everyone can see your trip. Can I upload a trip without making it public? Yes. Whether you’ve recorded your trip using the Ramblr app or you are creating a trip on Ramblr.com you can change your visiblity setting before publishing your trip and set the visibility setting to private or secret. Public means anyone can see your trip, secret means anyone with the link can see your trip, and private means only you can see your trip. Also, you can change the visibility of a trip after uploading both on the app or on Ramblr.com by editing your trip. You also can change the visibility settings for any trip on the app or on Ramblr.com. You can do this by editing your trip. In the app: select the trip, then select more “...”, then select edit trip, then select Edit Title/Desc. to change the visibility. Select the check mark to save. On Ramblr.com: Go to My Archive, select the trip, press edit, and change the visibility setting at the top right of the trip. How can I change a trip uploaded in private mode to public mode? How do I create trip from a .gpx or .kml GPS file from a GPS device? You can use a GPS file to create a trip on Ramblr. First, log into Ramblr.com on your desktop brawser and select Create a Trip from the top menu bar. Then, select a .gpx or .kml file to upload (.gpx or .kml files are recorded from GPS devices, or from editing tools that support the .gpx or .kml format). Then select a map type, add photos and other media files, add your description, tips, tags, and select "good for" boxes. Publish to finalize your trip. Can I see my trip computer while I’m recording? While you are recording/tracking with the app, you can see the trip computer (this shows your elapsed time, average speed, distance, speed, elevation, max speed, total ascent and more). Select the trip computer icon (a gauge shaped icon located on the bottom right of your tracking screen) to see your trip computer. Press the globe icon to return to your tracking screen. How can I change map type (Road, Satellite, Terrain, etc) on the Ramblr App? To change the map type before you start tracking, select the map icon (located above the compass icon on the tracking screen). You can pick from road, satellite, terrain, street, and cycle maps. After you upload a trip from the app or by creating a trip on Ramblr.com you can edit any of your trips at any time. Follow these steps to edit a trip. 1) Log into Ramblr.com on your desktop browser. 2) Go to "My Archive"
3) Find the trip which you wish to edit and press edit. 5) You can add or delete photos, videos, notes, audio & trip description, title, tags or any trip details. You can edit your track by using the Track Editor tool box. You can change the type of map by selecting the map type from the box on the map. 6) Press "Publish" to save changes. You can also edit your trip on the app. Go to Mt Archive, launch a trip viewer by selecting a trip you want to edit, and select “More->Edit Trip”. Is it possible to add (more) photos to my trip when uploading or after uploading? Yes. You can add photos while you are uploading from the app by selecting “Edit & Upload” then select “Add Photos”. If you’ve already uploaded and you wish to add more photos you can edit your trip on Ramblr.com from your desktop browser. While editing on Ramblr.com, you can add photos from Picasa, Panoramio, Flickr or your own files. This means that you can add in your camera’s photos to trips tracked with the app. How can I delete a photo from my trip on the app? It is possible to delete photos after tracking but prior to uploading with the app -or- after you have uploaded a trip. To delete photos from a trip after you stopped recording with the app - select ‘Edit and Upload’ and select the trash can/delete for photos you want to delete. How can I delete a photo from my already uploaded trip? Please follow these steps to delete a photo from a trip which is already on Ramblr.com. Please note: Be careful not to press "delete this group". All deleted photos are final before you publish (you can't cancel and go back to the previous version of you trip). How can I delete my trip which is already uploaded? Log into Ramblr.com on your desktop browser and go to My Archive. Then select delete to the right of the trip you wish to delete. How do I delete a trip saved as a draft? Go to My Archive and select the trip from the waiting for upload list. You will be prompted to upload or delete. How do I upload a trip I saved as a draft to upload later? To upload a trip saved to your phone as a draft: Open the app, select My Archive, select the trip you wish to upload from “waiting for upload” list and select upload now. A notification will appear with the uploading progress and alert you when it is finished uploading. How do I create a trip with the Trip Editor feature (How do I draw my track)? Add in your trip title, date, type of trip, difficulty - by clicking in the highlighted blue boxes. Add your description, tips, tags, and select "good for" boxes. How do I use Ramblr without the app or GPS (.gpx/.kml) file? 4) Find the area on the map you which to work with / zoom in on the area. 5) Use the "pencil" tool to start drawing your track. 6) Finish making the track & fill out the rest of the trip details. How do I edit my already recorded & uploaded track? 4) Use the Trip Editor tool box to modify your track. For example you can add on to your track or remove an unwanted portion of your track. To extend a track: Use the "pencil" tool to draw more of the track which isn't already on your track. Then merge the tracks together. To remove a portion of your track: Select "split track" (click split track then click on a way point where you want to split the track). Now you have 2 tracks. Select "remove a track" and then click on the portion you wish to delete. 6) Publish to finalize the trip. You can merge tracks which are on one trip. Please follow the instructions below to merge tracks. 1) Log into Ramblr.com in your full desktop browser. 2) Go to your My Archive page and click Edit next to the trip you want to work with. 3) You will see Tools in a box on the Map side. Click on the Tools. 3) Select Merge. You will be prompted to click on tracks you want to merge together. 4) Now that your tracks are merged into one complete track select Publish to save your trip. Please note that if you have a missing section you would like to add into your track, you can also do that. Use the pencil tool to draw the track and then merge it with the pre existing tracks on your trip. What is the “Trip Download” feature of the Ramblr App? The trip download feature on the Ramblr app allows you to download any trip to your app which can be seen even offline. You can also add a downloaded trip’s track on your map. To do so first download the trip by pressing more “ …” and download. Then open the downloaded trip (listed in your archive page, on the right tab) and press ‘more’ and ‘add trip route to map’. 3) Select "..." at the top right hand corner. Then select Download Trip. 4) To see the downloaded trip: Go to My Archive and look at the Downloaded trip list on the right tab." How can I see downloaded trips in the Ramblr App? To see the downloaded trip: Go to My Archive and look at the Downloaded trip list on the right tab. What is the “Add a route on a map” feature of the Ramblr App? To do so first download the trip by pressing more “ …” and download. Then open the downloaded trip (listed in your archive page, on the right tab) and press ‘more’ and ‘add trip route to map’. How to remove a route already added on a map in the Ramblr App? To remove a trip route from the map which was added from a downloaded trip, go to My Archive, then downloaded trips, then select the trip you previously added, then select more, then select ‘remove trip route from map’. What is the “Compare with my trip” feature of Ramblr.com? If you wish to compare another Ramblr user’s trip’s speed and/or altitude stats with one of your own trip’s stats, you can use the ‘Compare with my trip’ feature. On a trip you can see the Compare with my trip green button located in the stat box near the top of the trip. After you press the button, select the activity type and/or title of your own trip you wish to compare it to from the drop down menu boxes at the top left of the screen. Moving your mouse along the graph will highlight the stats at specific points of the trip. Select or unselect the speed and altitude graphs by clicking on the options below the graph. How can I see bookmarked trips on Ramblr.com? To get to your bookmarked trips first log into Ramblr.com in your desktop browser and go to My Archive. Then, select the tab “Bookmarked Trips” which is located on the right of the My Trips tab. 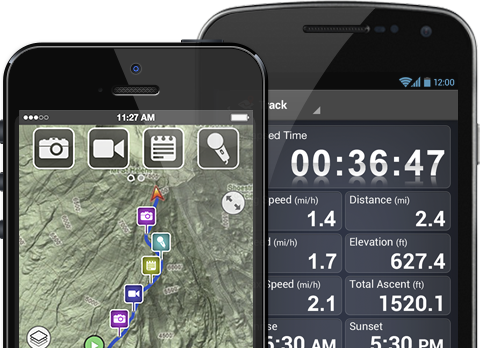 The Total Ascent stat is the sum of all vertical feet you climbed while tracking with Ramblr. E.g. If you climb a 2,000 feet mountain three times while tracking, the total ascent will be 6,000 feet. How do I download my trip’s gpx file? How do I know how many people viewed my trip? At the bottom of each trip on the right hand since under the comments, you can see how many views, comments, and likes there are on that trip. You can find weekly top 50 leaders at "Recent" of www.ramblr.com. You also can check out your lifetime ramblr points and at "My Archive" and weekly statistics graph at "My Archive -> Statistics". How can I make my trip private, secret, or public?